LOOK BEAUTIFUL AND FEEL CONFIDENT - Each pendant measures 0.6" inches (h) , set is made in a 925 Sterling Silver backing coated in 18K White Gold. Its 18" chain delivers a flawless fit for the girlfriend, bride, bridesmaid , mother, teen daughter or granddaughter in your life. Matching Stud Friction Back Earrings of 0.25" diameter and adjustable 6" to 7.5" Bracelet complete a stylish ensemble for any occasion. 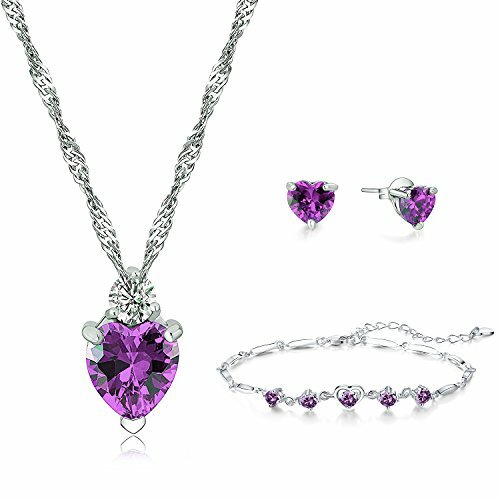 MAKES A GREAT GIFT: An elegant jewelry set is the perfect gift to give young girls or fully grown women. You can use this set for any special occasion for yourself or as a gift for anniversary, engagement, wedding and bridal parties, birthday or others. AFFORDABLE: You get a real value for your money when you buy this set. It is made of high quality materials and in a very professional way so it looks and feels luxurious and gorgeous. 100% SATISFACTION GUARANTEE - At Majesto Jewelry, we are confident that you will love our jewelry. In case you don't like your item you can return it within a 30-Day mark for a full refund. In addition, RISK FREE buy gives you a 90-Day, Replacement or Refund Guarantee in case there is anything wrong with the product. If you have any questions about this product by Majesto, contact us by completing and submitting the form below. If you are looking for a specif part number, please include it with your message.